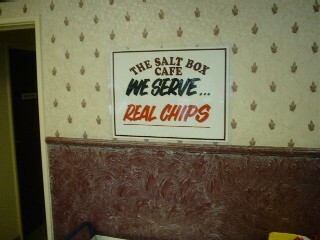 The Salt Box is a great transport cafe. Which proudly boasts of real chips. Real, delicious chips. And thick, pink bacon. And incredibly hot tea. There's nothing quaint or retro about it. It's a bit like someone's conservatory, but it's a fantasticly efficient place for serving large quantities of delicious fried food. Love those booths and menus. I bought this brilliant little booklet there, produced by a locally based trucker. Now all I need is another sabbatical and I can visit them all.